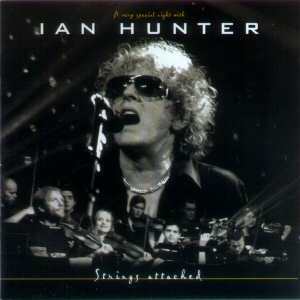 Ian Hunter CD: "Strings Attached"
It was only a matter of time, really. With most if Ian's contempories having gone down the well-trodden "unplugged" route, it seemed inevitable that one day Ian Hunter would follow suit. Hence two specially-arranged gigs in Oslo, Norway on 29th and 30th January 2002, which were recorded and filmed (for the accompanying DVD). With his regular guitarist Andy York in tow, and backed by a 20-piece string section (the Trondheim Soloists), Ian performs what are, in effect, orchestral versions of many of his well-known songs, with a few new songs and rarely-aired numbers to keep the regular punters happy. It all works surprisingly well. From the opening strains of Rest In Peace (not aired since his days in Mott The Hoople), you know that this disc will delight and surprise in equal measure. Twisted Steel (which is about the events of 9/11) shows Ian as incisively observant as ever, while 23A Swan Hill (one of the best songs Ian has ever written) is just as powerful in the new format. Rollerball is another new song, a medium-paced rocker that shows Ian is showing no sign of losing his touch. Nightingale is the only cover version here (the first Ian has performed in a long time) is beautiful, with the audience listening quietly to the lyrics. Roll Away The Stone is, as one might expect, the slower arrangement fans may remember from Ian's tours in the late 80's/early 90's and is none the worse for that. To these ears, however, neither Once Bitten nor All The Way From Memphis translate as well - don't get me wrong, they're still great tracks, but I feel as out-and-out rockers they haven't translated as well to the new format. Only one track from Rant is present here (Wash Us Away), which is good, as it allows Ian to cover all parts of his cereer rather than just "the latest album". The CD ends in fine style with what was at the time his regular set-closer, Saturday Gigs, with the orchestra individually providing the vocals on the "we do, we do" at the end. A great way to close what is a rather tasty album.